Innova™ IGS 520 is a floor-mounted image-guided system for cardiovascular and electrophysiology procedures in the cath lab. With its 20.5 x20.5 cm (8.1 in) square flat-panel digital detector, Innova IGS 520 offers 38% greater coverage than 17.7 cm (7 in) square panels and thus limit panning during your cardiac procedures. It is designed to help you achieve steep cardiac angulations. The system is designed from the ground to provide the image clarity you need while helping you keep dose as low as possible. It includes features like InnovaSenseTM,1, an advanced patient contouring technology that uses an active sensor to assess movement of the gantry and select the optimal position for the image receptor relative to the patient. By reducing the distance from the receptor to the patient, the system optimizes imaging geometry and helps reduce radiation exposure. Powered with the new generation of GE's advanced interventional imaging software solutions, ASSIST, you can expand your clinical versatility and successfully plan, guide and assess increasingly sophisticated procedures with greater precision and dose efficiency. With its 20.5 x 20.5 cm (8.1 in) square flat-panel digital detector for EP procedures, Innova IGS 520 offers 38% greater coverage than 17.7 cm (7 in) square panels. It covers more anatomy, designed for fewer runs than smaller detectors, enabling efficient use of contrast and dose. The proprietary angiography flat-panel detector offers one of the industry’s highest ratings for Detective Quantum Efficiency (DQE), a parameter internationally acknowledged as an index of detector performance in contrast- and dose-limited imaging performed in clinical studies. High DQE enables better-quality images at the same dose, or the same quality image at a lower dose. GE designs systems from the ground up with the tried and trusted GE imaging chain, optimized to provide the image clarity you need while helping you keep dose as low as possible. Our dose-reduction features empower you to easily optimize and personalize dose settings from the tableside, while maintaining clinical details you need to make well-informed decisions. But improving dose management takes a strategy – what we call the GE Blueprint. It includes low-dose imaging technologies for minimally invasive procedures, but also considers the people, culture and processes around them. Control your system and images with integrated, intuitive tableside controls. With simple menus, the Central touchscreen lets you control most system functions, configure the system, modify imaging parameters, control your large display monitor6, and manipulate advanced applications – all at the tableside. The comfortable, easy-to-grasp control knob makes it easy to pan the table, position the gantry, and perform procedures. The full-color 8 megapixel medical-grade large display lets you view multiple images from multiple sources. Get up to 120 customized layouts, easily changeable at tableside with the Central touchscreen. Zoom in comfortably without loss of detail or pixilation to get the clinical focus you need. 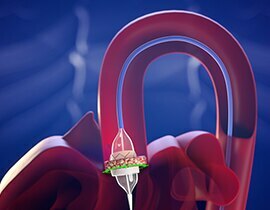 The interventional field is growing with ever-expanding capabilities and migration to less invasive, safer and more cost-efficient procedures. With the new generation of GE’s advanced interventional imaging software solutions, ASSIST, you can expand your clinical versatility and successfully plan, guide and assess increasingly sophisticated procedures with greater precision and dose efficiency. PCI ASSIST2 helps improve visibility3 up to +85% in moving anatomy, and up to 75% in larger patients, at the same dose. With OneTouchQA measure the size of the vessel and analyze the percentage of stenosis from tableside directly from the Central touchscreen. Then, determine the optimal diameter and length for the stents you require for the case. StentVesselViz was used to open the first stent at the ostia level to get an optimal position for the second stent in the side branch. StentViz was used to guide the stents to reach minimal overlap. With StentViz precisely evaluate the stent overlap, fracture and uneven deployment. 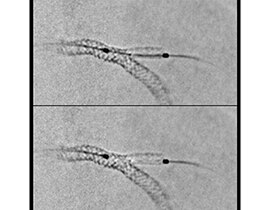 StentVesselViz enabled assessment of stent deployment in relation to the vessel wall. 0-click aorta segmentation and valve definition makes accurate valve sizing accessible to anyone. Leverage planning directly in the exam room with intuitive table side user interface. Calcification Enhancement improves the visualization of moving contrasted structures. Assess potential regurgitation with exceptional contrast visualization. Real time benefits of Ultrasound imaging5 or angiography all in one place. Segment easily the atrium in a single click. Measure the appendage neck. Define and mark in advance trans-septal perforation. Guide with confidence your trans-septal puncture and device deployment with pre-op CT overlay. Ultrasound imaging5 can be integrated to our Large display monitor6 . All information converge in one place to help you make fast decision. The clinical environment has changed. Your referring physicians need quick, detailed understanding of pathologies to deliver effective patient therapy. They expect faster, more advanced views of abnormal conditions across the entire range of care areas. With AW, you&apos;re able to deliver what they need. Valve ASSIST 2: Simplifying the complex structural heart procedures. In clinical use, the results of the application of dose reduction techniques will vary depending on the clinical task, patient size, anatomical location and clinical practice. The Interventional cardiologist, assisted by a physicist as necessary has to determine the appropriate settings for each specific clinical task. 4. Valve ASSIST 2 solution includes TAVI Analysis, HeartVision 2 and requires AW workstation with Volume Viewer, Volume Viewer Interventional. These applications are sold separately. 6. The U/S Image on the Large Display Monitor is for information. The primary display for U/S imaging is on the Ultrasound screen.